There have been an increasing number of efforts that are all designed to support Chris Romulo’s efforts to rebuild his gym CROM. It’s been well known how Hurricane Sandy has wreaked havoc on the lives of business owners specifically in Rockaway, New York. There have been several individual efforts from Muay Thai Preservation Project’s donation drive and Muay Thai at the Mecca’s efforts. Coban even joined the cause with a seminar benefiting CROM’s recovery. But now long time New York promoter Friday Night Fights will have a fight card to help Chris Romulo rebuild his gym. For over a decade, Chris Romulo was a leader in establishing and defining the sport of Muay Thai in our region. Romulo continued to do so on a national and international level towards the end of his long and illustrious career. He & his wife Sarah then opened Crom Martial Training where, as a coach, Romulo continued to champion the values that we all admired and shared during Romulo’s fighting career. Hurricane Sandy ravaged Rockaway Beach where the Romulo’s gym and home were both located and destroyed. 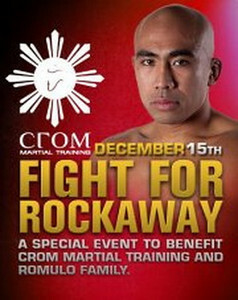 The fight for Rockaway will feature an incredible night of Muay Thai in celebration and support of Chris & Sarah Romulo! It’s good to see New Yorkers and Muay Thai’s east coast family come together to help one of their own. Chris Romulo’s gym is not only a Muay Thai gym but it’s a community center that does in fact help at risk youth. Check out the press they did for the event below. There has also been some cool limited edition clothing released made specifically to help Chris Romulo. You can purchase them here and here. ~ by fatsoking on November 18, 2012.